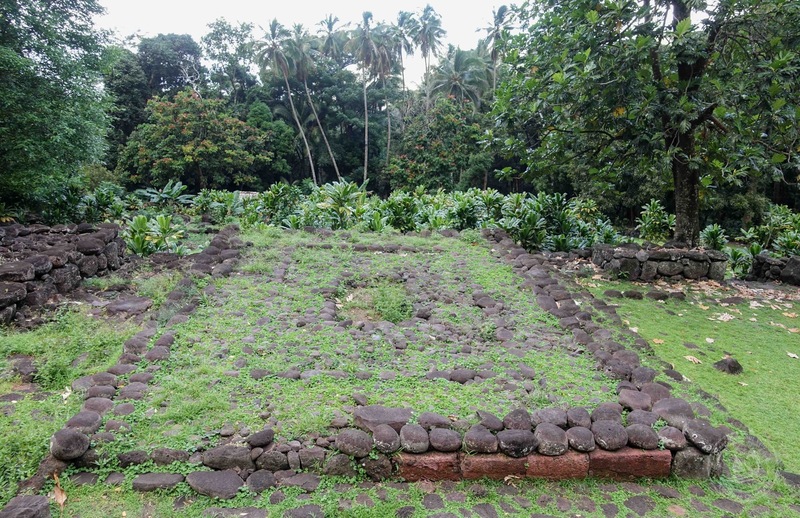 Every ancient village has a center plaza for dancing and village gathering – much like modern day Polynesian towns. 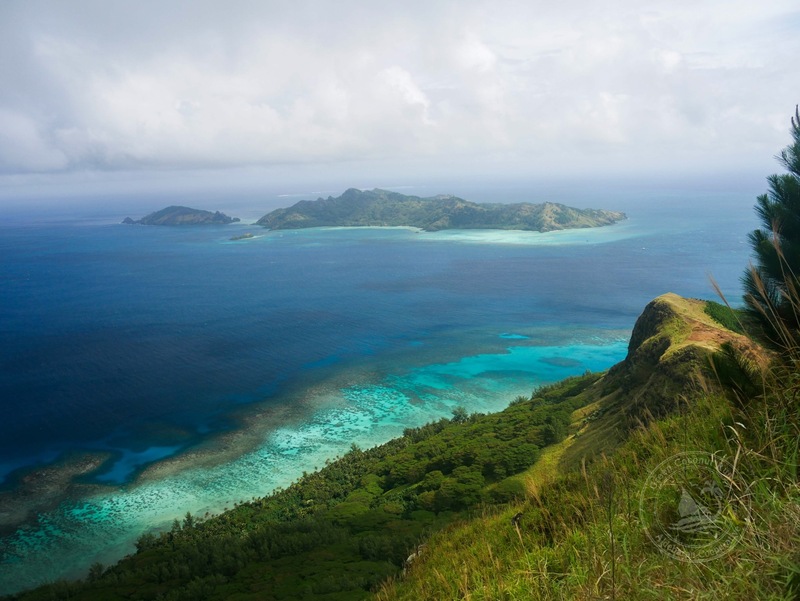 I often wondered why some of the largest ancient Marquesan villages were located (at times) in valleys without great harbors or easy access to the interior of the island. 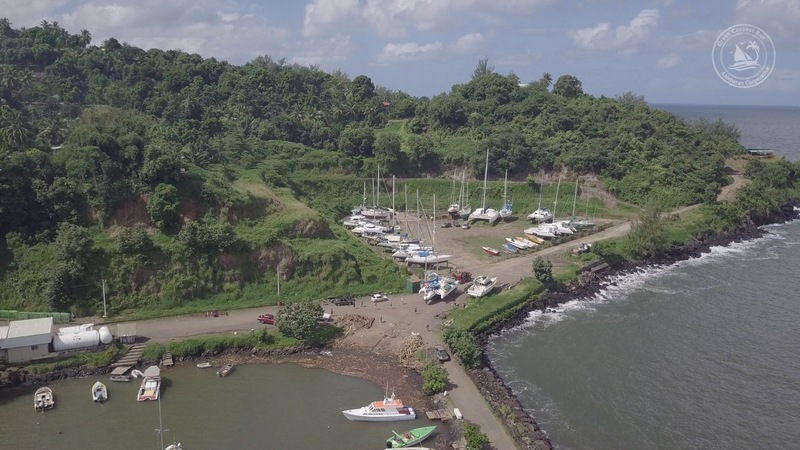 For example, Taaoa is located in a bay with a windy, surf ridden beach, a ten minute drive from Atuona, the current capital of Hiva Oa. In contrast, Atuona is next to the most sheltered bay on the island (where we hauled out our sailboat). The incredible peak rising above Taaoa , as seen from the Atuona side. This was our view from Aldebaran while hauled out in the boatyard. Directly behind Taaoa, however, is a gigantic steep 3000ft mountain peak. This was an amazing power spot! I speculate that villages were built in powerful locations more for the “mana”, or life-force, than for economic reasons or transportation access. What do you think? Maybe someone with internet can verify this hypothesis. If you have a comment to share, write in the Reply section below. Our friend Mu has the heartiest laugh ever. He made Hiva Oa home for us. For our last night in the island he prepared a feast: “chevre à la broche”, which is wild goat on the BBQ marinated with secret sauces. Dinner was also served with the usual feast of poisson cru and other Marquesan dishes. 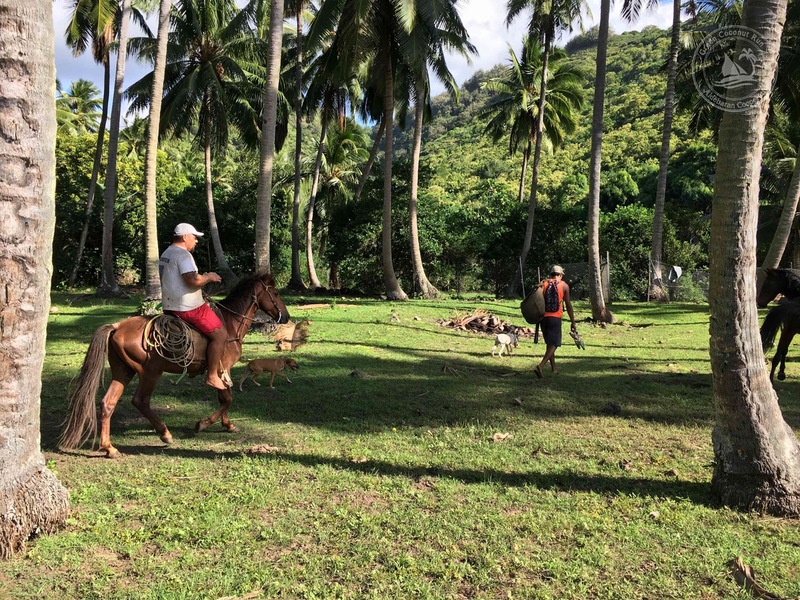 Hunting for wild goat and pig is part of Marquesan daily life. There is a bountiful supply of both on every island. Since Mu loves both fishing and hunting, he has a special technique for catching goats: he finds goats that are perched precipitously on a cliff over the ocean, shoots them with a rifle from his rolling dinghy, in such a way that they fall into the water. Then he scoops them up like fish. This is a very tough shot and not many people can make it. 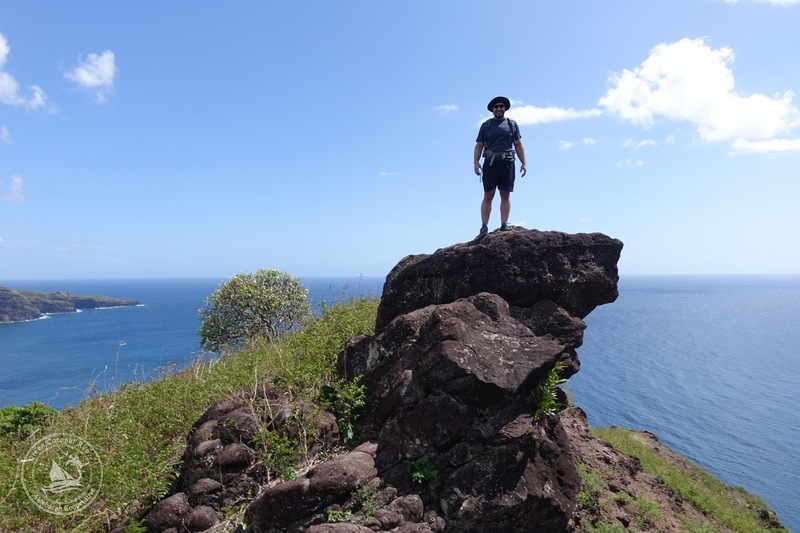 But if you can, it sure is easier than trekking up the steep mountainous valley of Marquesas. Mu tells us this story and then laughs even more heartily. Photo: Sabrina and Celine (a fellow cruiser) with Mu. Our crew was also at the goat roast, their first evening with us (Matt, Judy, and Adam’s family). 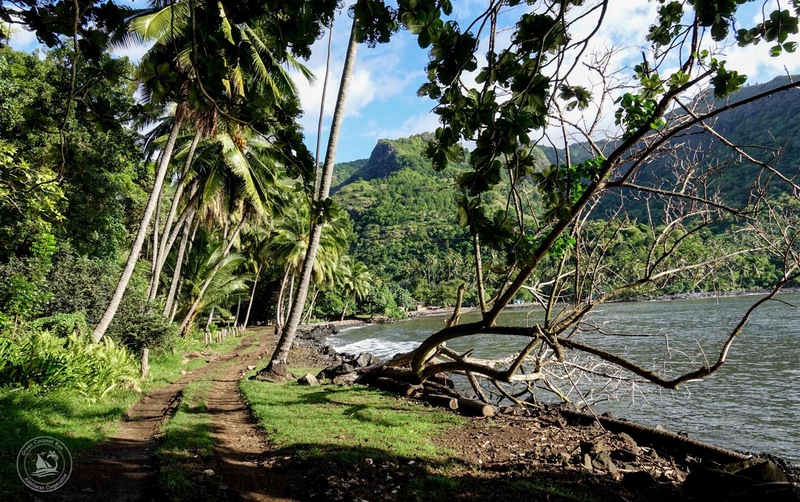 The largest tikis in all of French Polynesia live in the lonely valley of Puamau, in the far eastern corner of Hiva Oa island. Mu drove us expertly on the dirt track like a rally racer. “It’s much more fun in a rented car!” he hollered, downshifting around a sharp hairpin corner that led into yet another fantasy bay. The Toyota Hilux moaned happily as it accelerated into the next steep climb. Rodrig led us up the path, looking like a happy Greek gladiator, with his white flowing outfit, leather belt, and criss-crossed sandals. He took his time walking up the steep slope, pointing out the downhill area where all the coconuts roll towards. “So that I don’t have to come up the hill to fetch them,” he beamed. A decrepit stone wall terraced the hillside in the next switchback. It was evidence of a Marae, an ancient religious site. “Check it out! Petroglyphs,” said Chris, huffing like the rest of us. Two figures with outstretched arms were carved into the rough rock. Behind them, a banyan tree guarded the pass into a thin ridgeline. 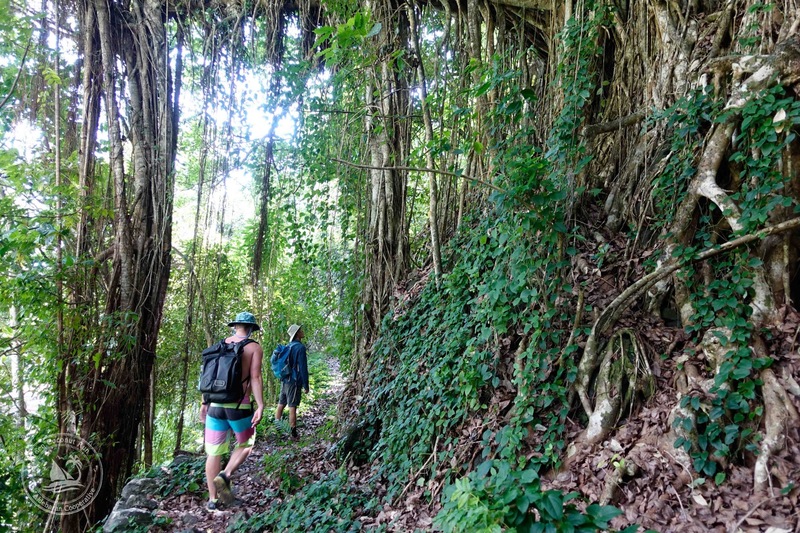 Rodrig moved a few stones next to the spiderweb-like roots of the banyan tree, and signaled us over to see. A pile of old human bones lay in a heap. “The ancient made their cemeteries under the banyan trees. Their roots are the connection to the spirit world. Almost every banyan tree has a pile of buried bones, if you know where to look,” Rodrig explained. 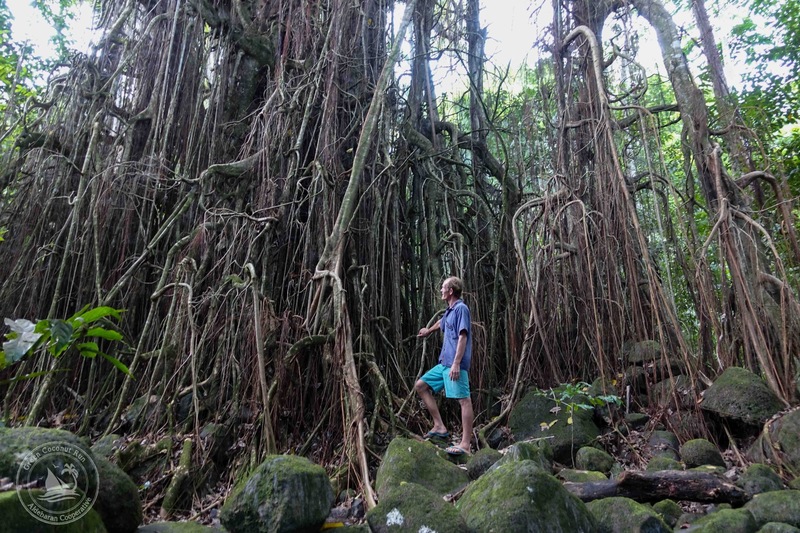 We stood pondering this fact, considering all the banyan trees we had walked past, and unbeknownst to us, all the human bones that were hidden deep within their roots. A clearing with rocks running parallel drew us further upslope. There it was! A stoic rock figure, powerful in stance and expression, stood gazing at us, or past us. “Le Tiki Pêcheur,” introduced Rodrig, which means ‘The Fishing Tiki’, so named for his power to assist or obstruct the efforts of fishermen. He wasn’t very large, but he was formidable. The tiki had giant eyes, pursed lips, and stood with hands bracing his hips – like a martial artist drawing energy into his stomach. Like a tiger surveying his domain, frozen in time and space, the Tiki stood overlooking the valley. 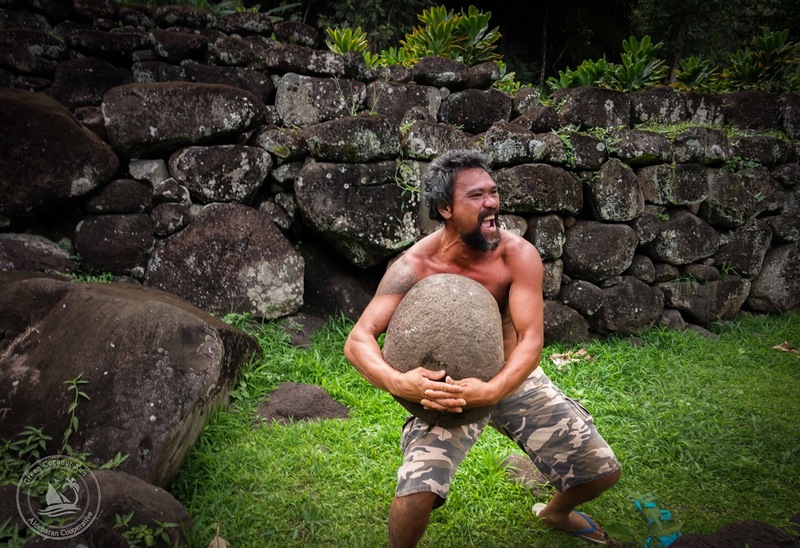 Polynesians describe power in terms of ‘mana’. Ancient kings commissioned the Tiki statues in attempts to have access to increasing amounts of mana. In its wild, raw environment, the Tiki Pêcheur still pulses today, alive with mana. Local copra farmer Rodrig holds the skull of an impressive old goat he shot while hunting. Hunting for food- including wild boar, goat, sheep and chicken- is a weekly ritual for many Marquesans. And finally, here’s a panorama of our fearless Marquesan leader Mu overlooking a beautiful bay on the road to Hanapaaoa. This story starts with a bag of coffee in the Galapagos. 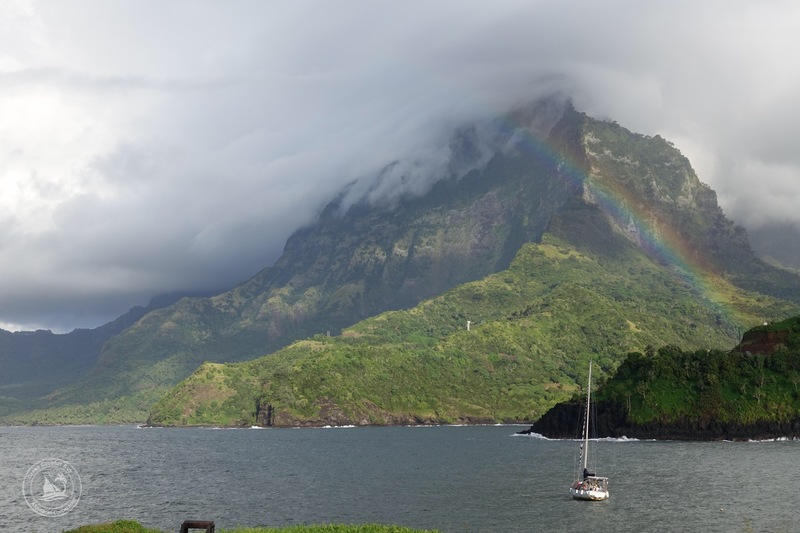 “Take this gift to Alec Mu in Hiva Oa,” said Diego, our Ecuadorian friend who had worked in Marquesas on a big yacht. 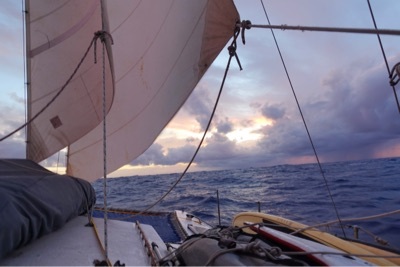 When we arrived in Hiva Oa we asked around for “Mu”, as he is known, and had him over to the boat with his son. He’s a jovial, stoutly built Tahitian with Chinese ancestry. For a living he trims trees along the roadside (to keep them off electrical wires). He came to Hiva Oa for his two year army service, met his wife, and never left. 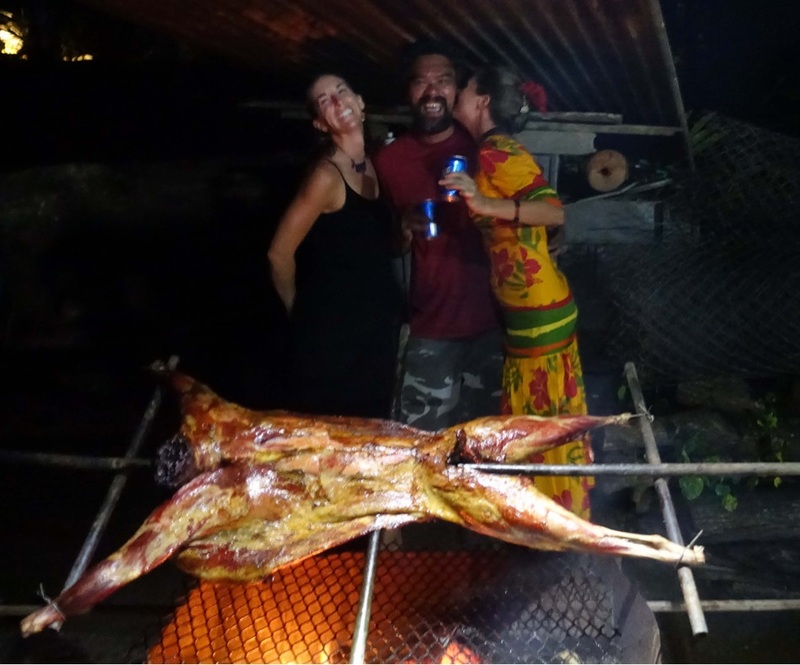 When we sailed to Hanaipa, on the north coast of Hiva Oa, we were surprised to bump into Mu at the local BBQ. “My wife is from Hanaiapa,” he explained, and introduced us to his brother-in-law. It was arranged. 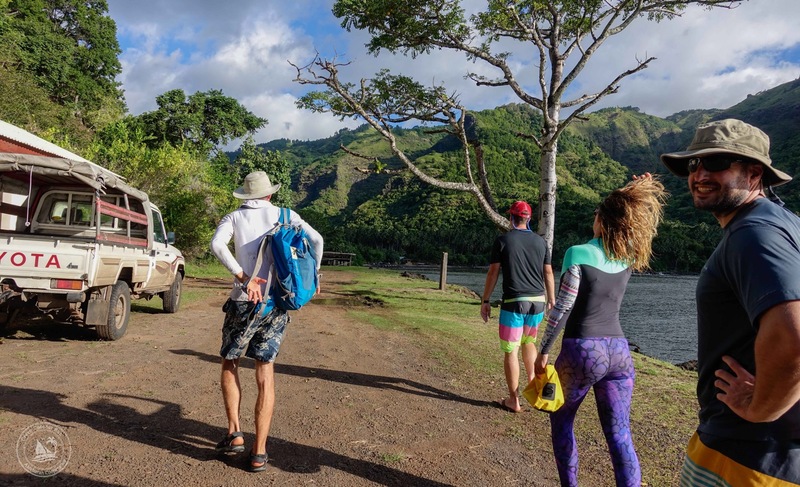 The five of us jumped into a 4×4 Toyota, bumping with Polynesian tunes, and hit the pavement, climbing out of the steep valley in extremely circuitous roads. Mu knows Hiva Oa like the back of his hand. 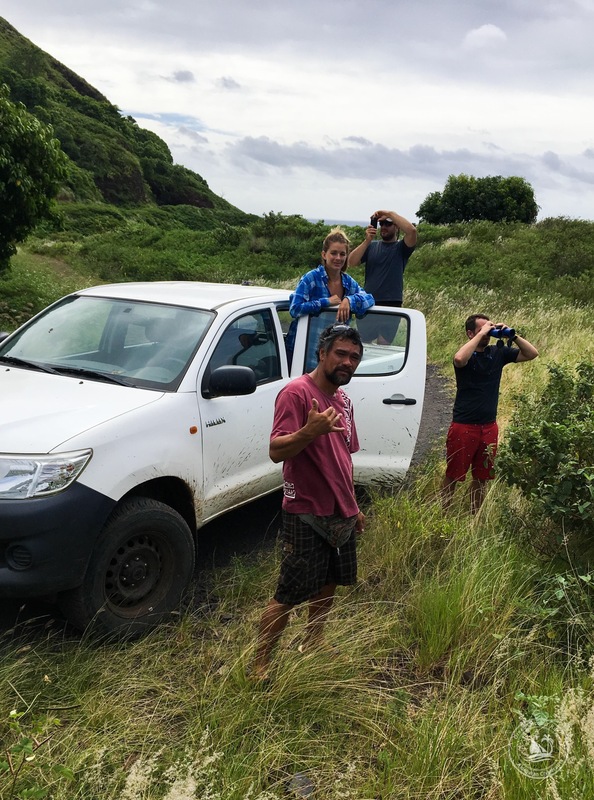 He drove us up random muddy tracks, crawling in four wheel drive, leading to vistas of the island. Our first major stop was the village of Hanapaaoa. Mu changed music on the stereo, then said: “This song is about the Giant Pig. 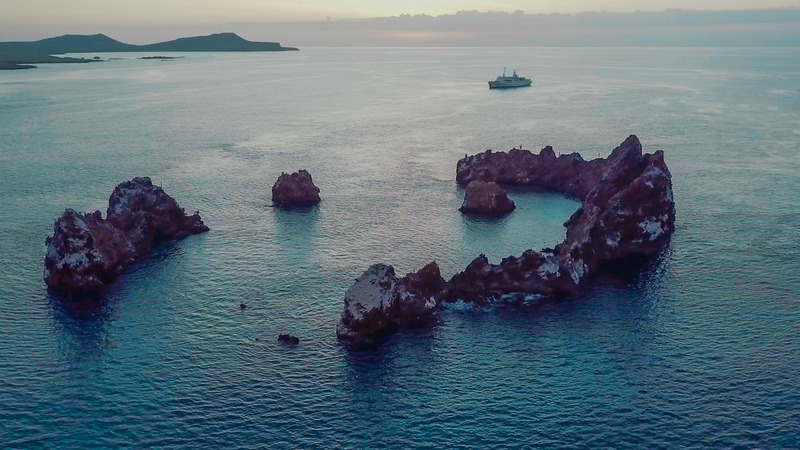 During ancient times, the people of another island did not have enough food, so the king of Hiva Oa sent the Giant Pig swimming across the ocean, where it collected many fish, and brought it to the hungry islanders. After they finished the fish, the islanders also ate the Giant Pig. 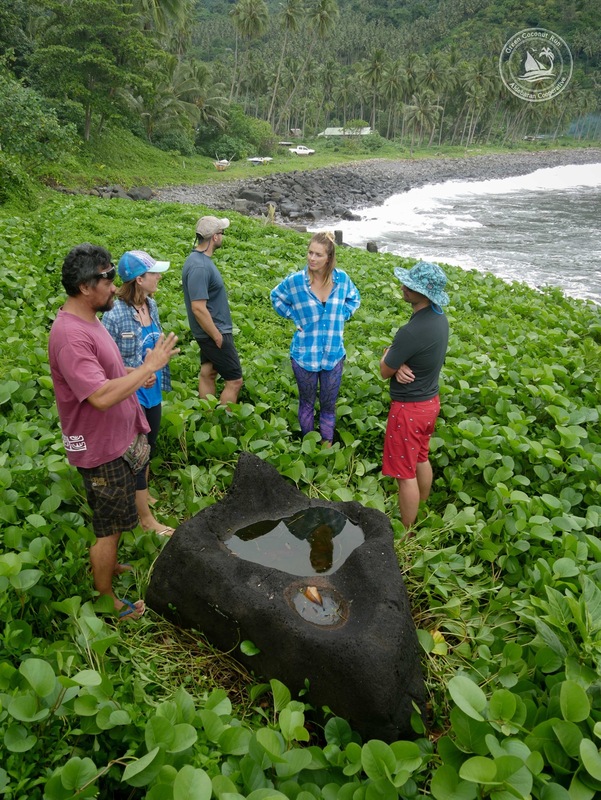 You can still see the foot print of the Giant Pig here in Hanapaaoa as he was climbing into the water,” explained Mu. Sure enough, the massive footprint was in the rock by the seashore. 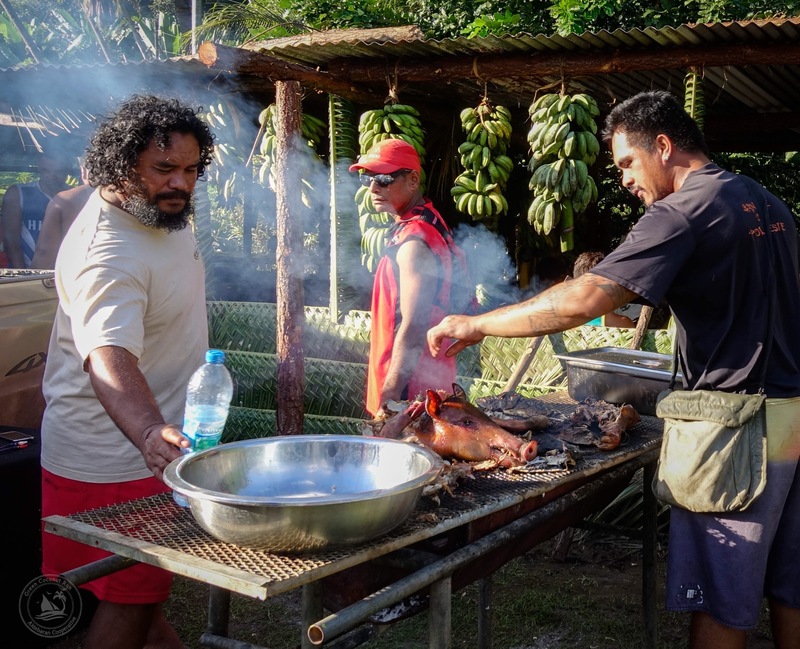 The Giant Pig reflects the spirit of gifting and sharing, so integral to Marquesan culture. 6am, Hanaiapa Bay. In the monotone grey of dawn I saw something moving in the water. It was far away… could they be little black wingtips gently breaking the surface? “Sabrina, there might be Mantas out here!” I hushed. She jumped out of bed and climbed the aft cabin ladder to peak out the hatch. “Oh God I stood up too fast. Woooo,” said Sabrina, dizzy and excited. I scampered on deck to drop two SUPs in the water, which we keep handy when at anchor. We reached into the dive locker and strapped our masks around our necks. Moments later we were paddling, searching the bay for the black wingtips. 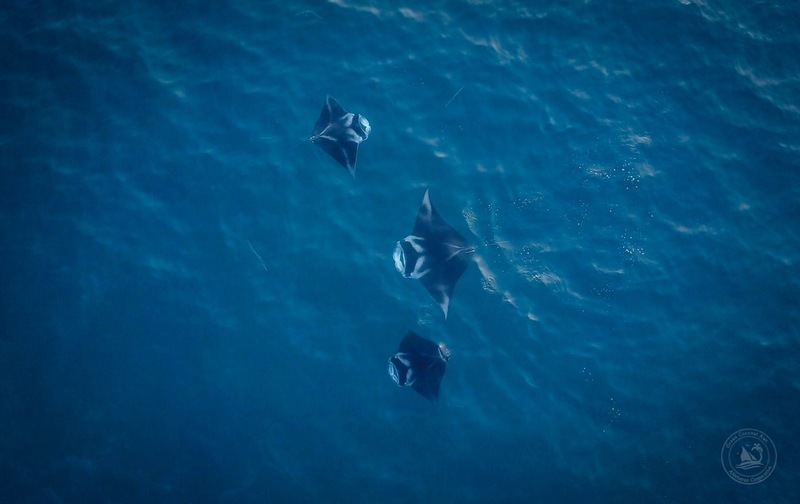 After a few minutes we came across the Mantas. 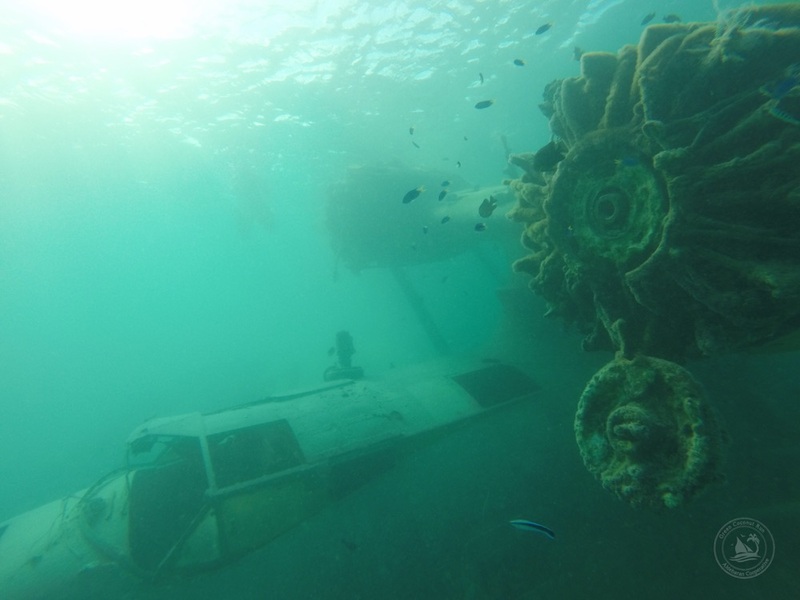 The underwater visibility was very poor. Yet, standing up on the SUPs offered a great vantage point to see the beautiful white markings that flow along their black bodies. 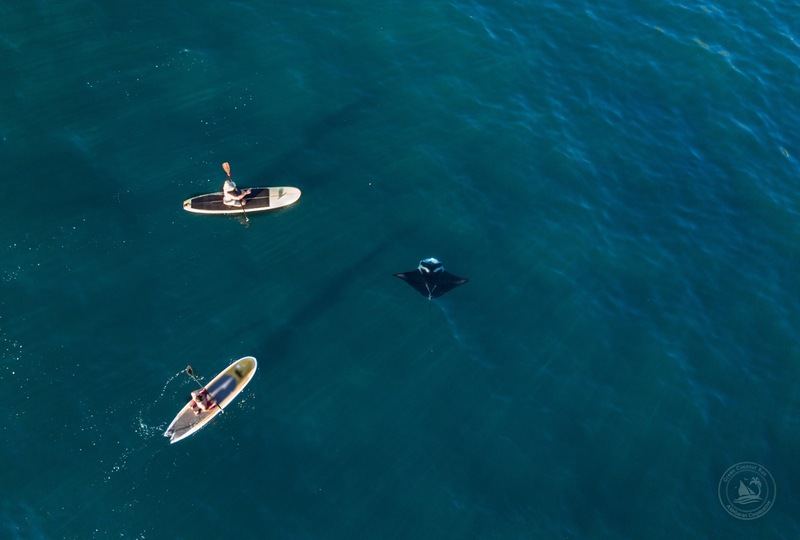 Each Manta has a unique identifying pattern, which seem to flow out of their flared mouths like the designs on aerodynamic jet planes. Back on Aldebaran, Pierre and Chris rallied and took over our SUPs. 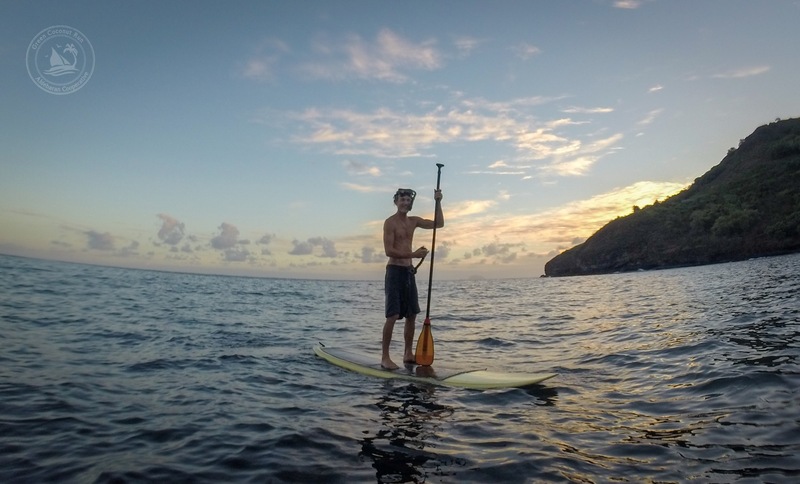 “Which direction to the Mantas?” Pierre asked, scanning the horizon. “About 100 yards towards the big rock,” I said. As they paddled away, Sabrina and I launched the Honey Bee from the foredeck. The drone zoomed over our mast as the sun crested over the valley. The glare of the sun now made it difficult to see the underwater creatures. The fellas were paddling around, searching. We flew Honey Bee high up in the air and turned the camera to point straight down. Immediately the distinctive shape of the Mantas clearly popped up on our screen. “Right there!” Sabrina said. Chris and Pierre followed the Honey Bee, which we parked high above the Mantas. Given the poor visibility of the water, we were amazed at how well we could see; even fish swimming along the surface showed up clearly. 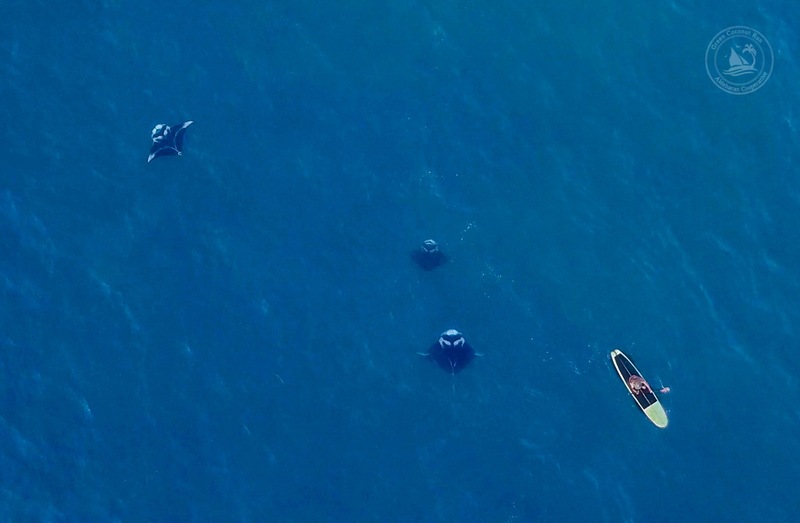 Flying forwards while filming downwards is very confusing, but we got lucky with a few moments when everything lined up: the fellas paddling with the Mantas swimming past. 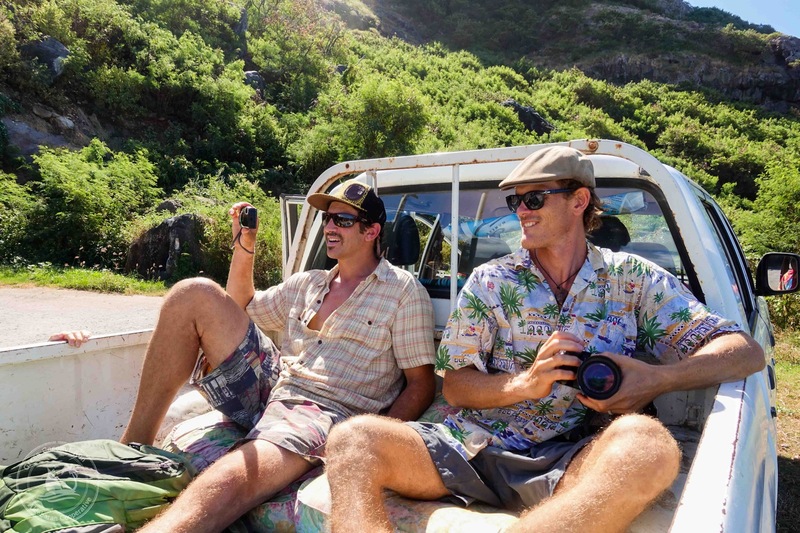 I was under the impression that Polynesians are supposed to be, well… relaxed about work. Even lazy. “The tropical sun and family culture makes them unproductive,” is the assumption. In Central America, the joke is that locals will get things done “mañana”… I’ll do that tomorrow! Here in Polynesia there’s a similar expression: “Fui”. As in, “I’ve worked enough for the day… fui!” It’s like a sigh of tired relief, converted into a word. Just like “mañana”, however, the idea of “fui” has become a frustrated joke that foreigners like to tell. Yet I’ve seen Polynesians work as hard as anyone else. How to reconcile this misunderstanding? 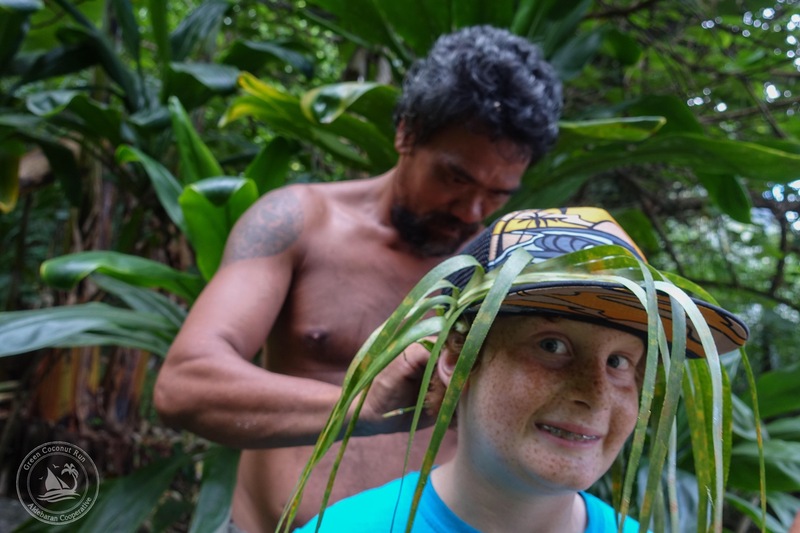 Case in point: we hiked almost 2.5 hours to the lovely cove of Hanatekua, which has no road access, and found three Marquesans there working copra. As usual, they weren’t dilly-dallying. Even as we talked, they were opening dry coconuts, removing meat, and taking a moment to go fetch us a few huge green coconuts to drink. This isn’t unusual, and frankly I’m always impressed by their keen productivity. If I were shelling coconuts every single day for a year, the hammock would surely be my constant companion, and I’d find every reason possible to procrastinate. 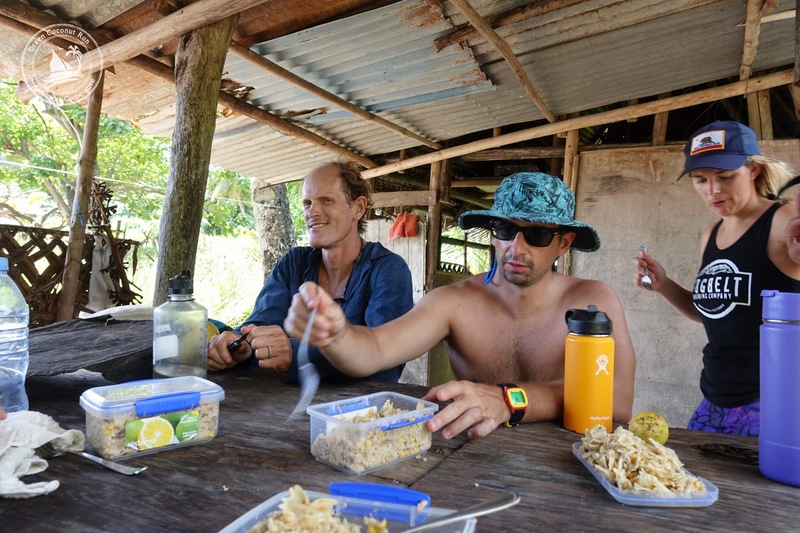 Our sailor legs were incredibly tired from the walk, and we meandered in dazed exhaustion between the wooden hut, the ocean, and the river that flows through the valley. 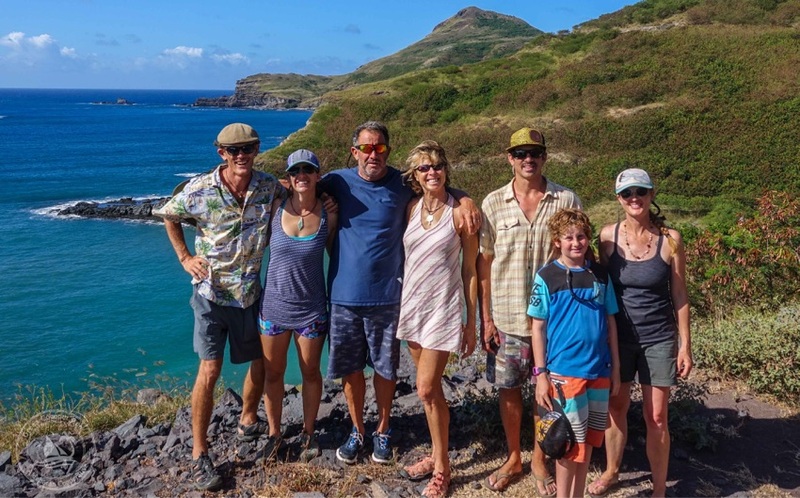 The cove of Hanatekua, like the rest of the island of Hiva Oa, has brownish water, and the beach has occasional swarms of no-nos. It is not a beach destination. Yet the land here is gorgeous. A pleasant river winds its way through wild orchards of fruit trees where the copra guys have temporary homes (they work here all week long, and return home for the weekend) to the coconut trees by the seashore. The hike itself was spectacular, criss-crossing ravines that revealed views from rocky outcrops one moment, to druid-like nooks of old trees the next moment. Goats scampered on the hillside and the easterly breeze kept us fresh in the shade. One of the older copra workers returned by horse along the trail to Hanaipa. 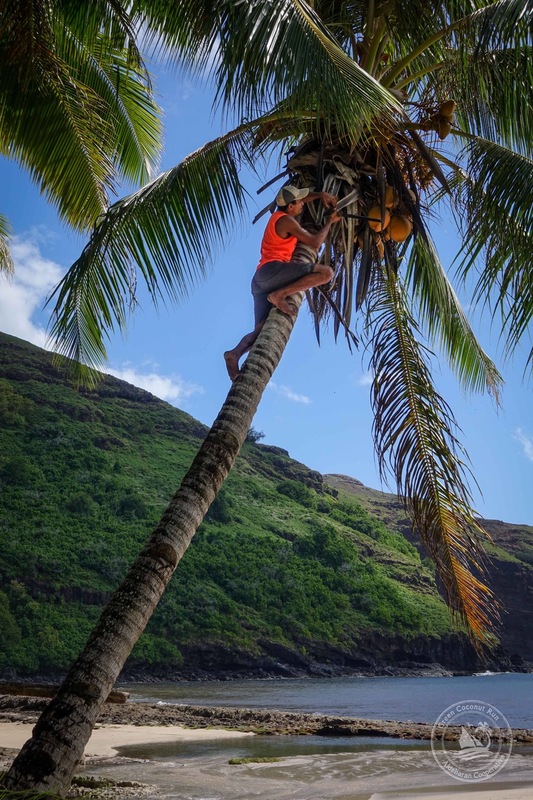 He nodded to a younger guy who was slamming down repetitively on coconuts with a huge axe, chopping them in half, sending fermented coconut water flying into the air. The axe-wielder showed no signs that he would be stopping anytime soon, evident from the giant mound of coconuts he was tackling. Instead of sitting idle the other young guy was cleaning the vegetation around their garden. 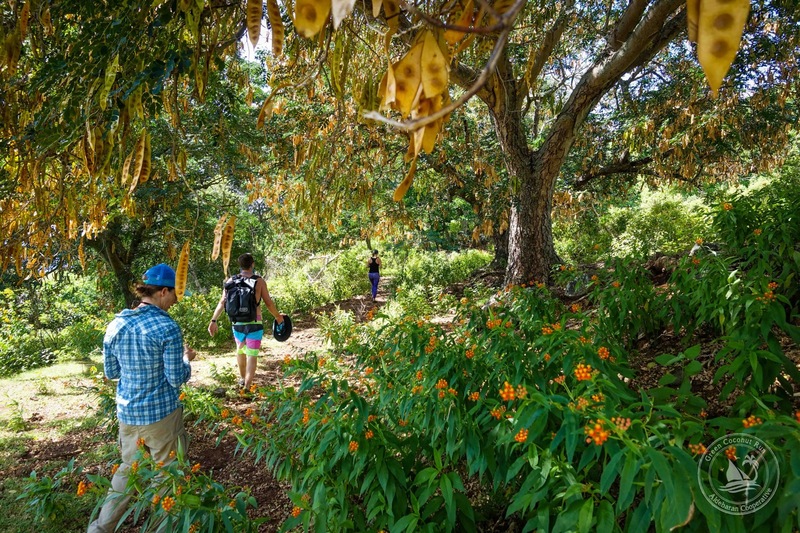 It’s worth noting that the gardens in people’s homes are impressively manicured, especially when one considers how fast things grow in the tropics, and how much fruit is falling on the ground. Talk about hard working! 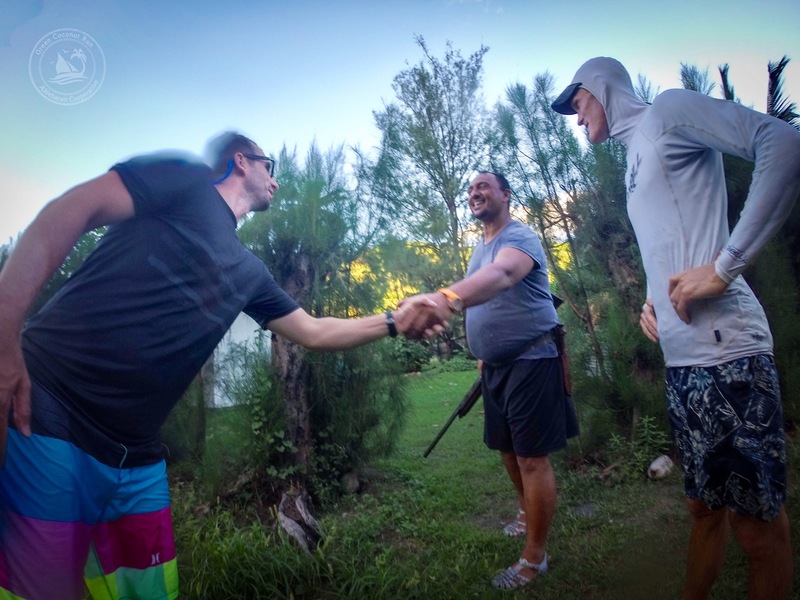 There is no doubt the people we’ve met so far – in eastern Polynesia at least – have a solid work ethic. Yet if you ask them to work on the weekend, or after hours, forget it. They are going pig hunting, or relaxing with their family. Personal time is sacred, keeping a smile and good attitude is paramount. So when it comes to getting things done, their priority is not punctuality. People are relaxed about the concept of time. Like the passengers on Air Tahiti flights that get turned around by bad weather, it’s how it goes. That relaxed approach is at the heart of “fui” and “mañana”. People are stress-free, and aren’t about to be rushed by anyone’s demands. This takes some getting adjusted to, and can be very frustrating when you’re on a time crunch. But it’s something we can all learn from, if we want to be as happy and stress-free as many Polynesians are. 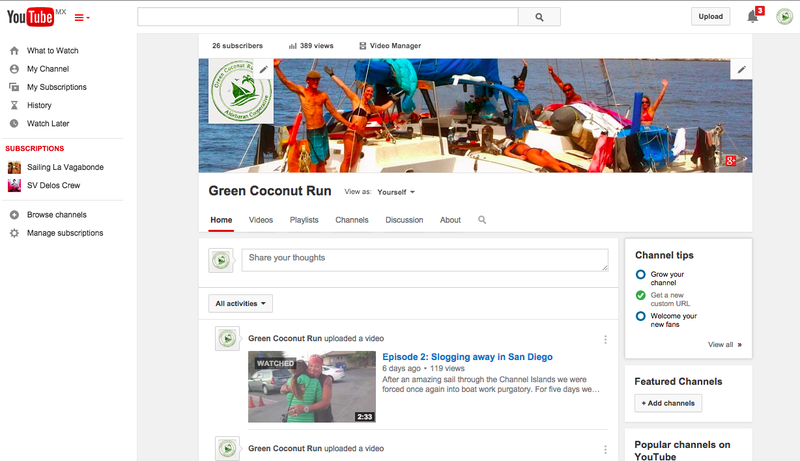 We first arrived in Fatu Hiva, after a crossing from Gambier Islands (via Reao Atoll). 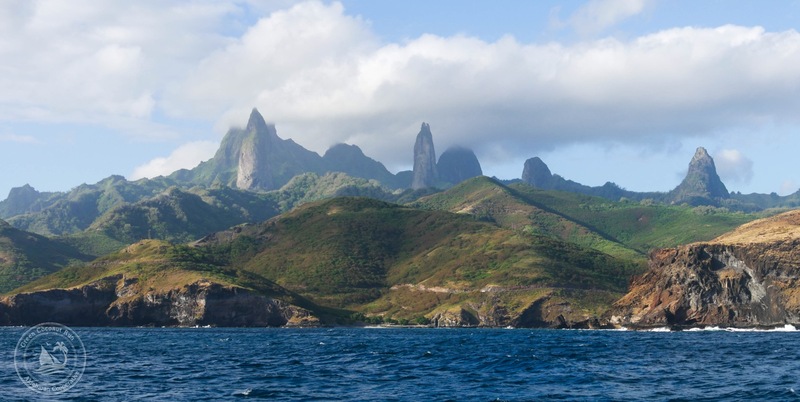 After that we went to the Hiva Oa, the largest island in the southern Marquesas. 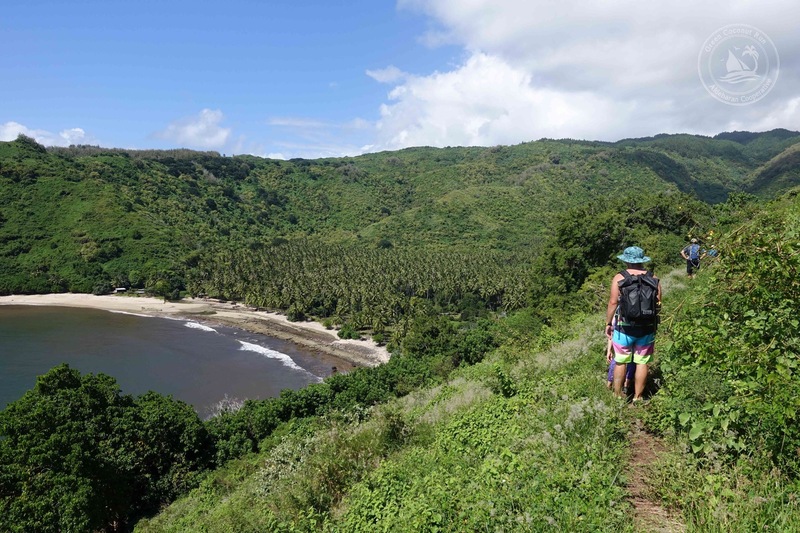 We cruised twice to the island of Tahuatu, before exploring the northern coast of Hiva Oa. 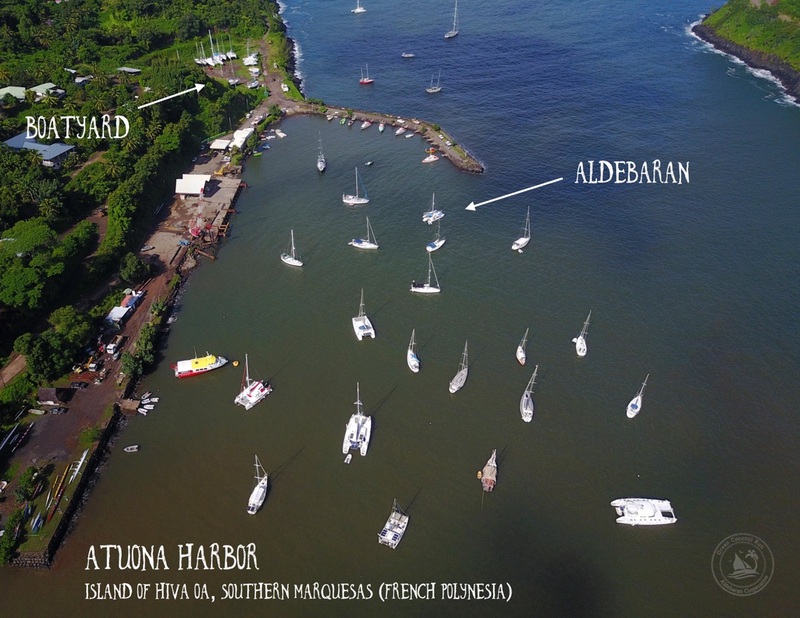 After we finish the repairs to Aldebaran, we hope to go to Nuku Hiva and Ua Poa, which are islands on the northern part of the archipelago. 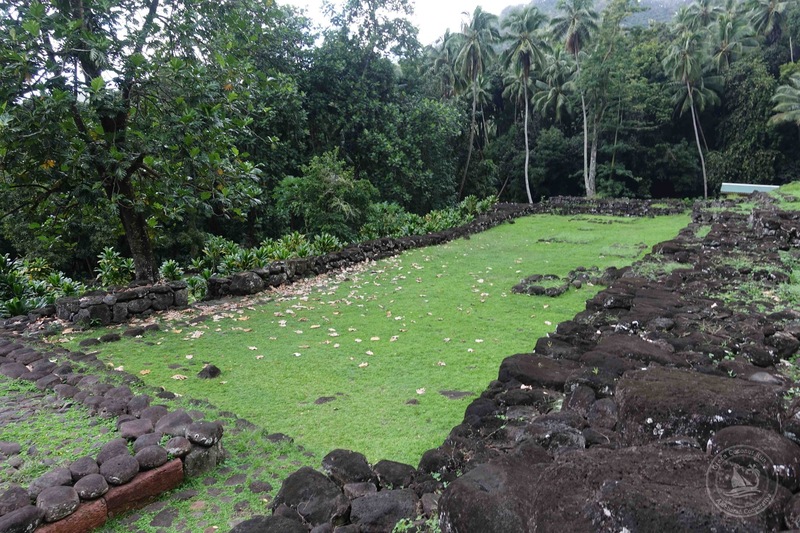 Atuona is the main town in Hiva Oa, also the regional capital of the southern Marquesas. 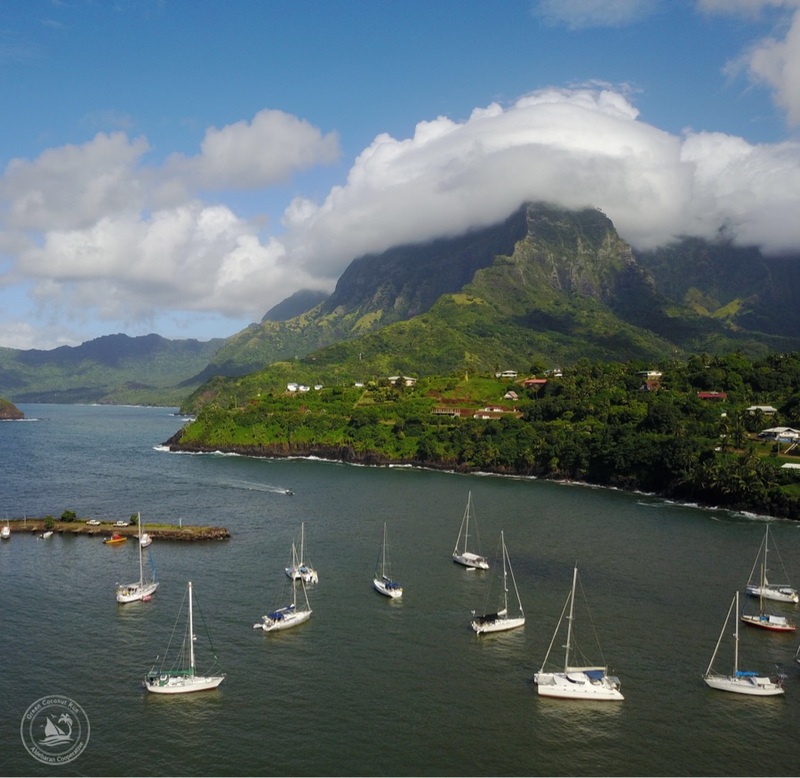 Many sailboats check into French Polynesia here after crossing the Pacific. It has spectacular scenery but we jokingly call the anchorage the “toilet bowl” for its swirly, chaotic nature. The island of Tahuata is just to the south a few miles. 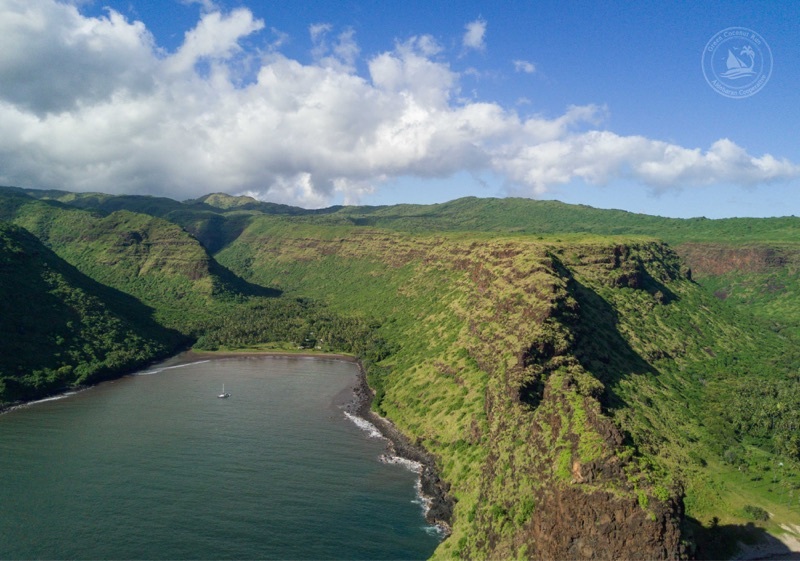 The primary anchorages in the north coast of Hiva Oa are Hanamenu (where we got eaten up by no-nos) and Hanaipa (which is as far as we’ll take Aldebaran on the north coast). 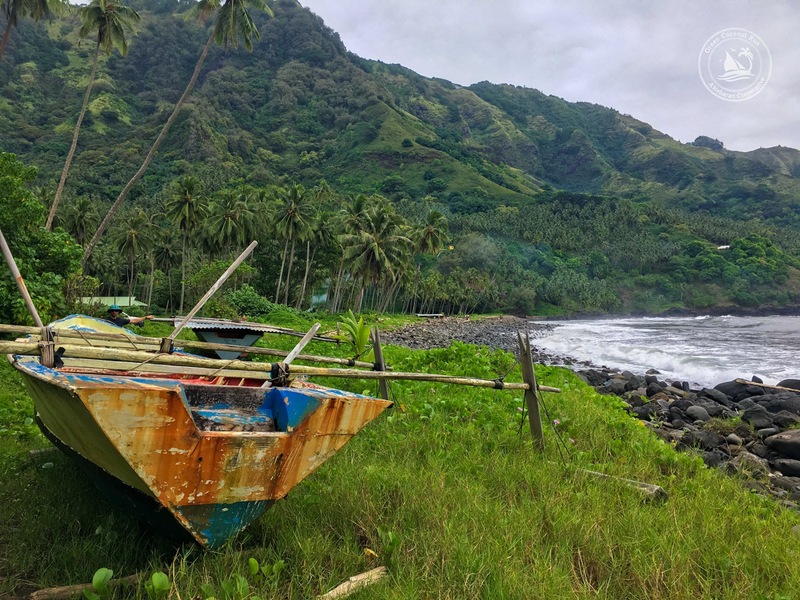 Further west, the bays of Hanapaaoa and Puamau are exposed to the easterly trade winds, so aren’t good anchorages; but they have great Tiki archeological sites; we want to try to visit them even if it means renting a car. The devilish mini-mosquitos that you can’t hear, feel, or barely see: these are the infamous No-Nos (also know as no-see-ums). They plague some of the beaches in the Marquesas. Only the following day, you’ll feel hundreds of bites on your back. It feels like a book written in Braille, and itches like heck. Such was our fate after visiting Hanamenu in the evening, a picturesque cove with a river and fresh water spring. The spring was directed into a pool of cold water, which was positively delightful. We met the caretaker of the property, Leon, who was walking out with a shotgun. “I’m going hunting for pig,” Leon told us, and promptly excused himself. The pigs were coming down from the hills where they sleep by day, and he had to be ready in his tree stakeout. 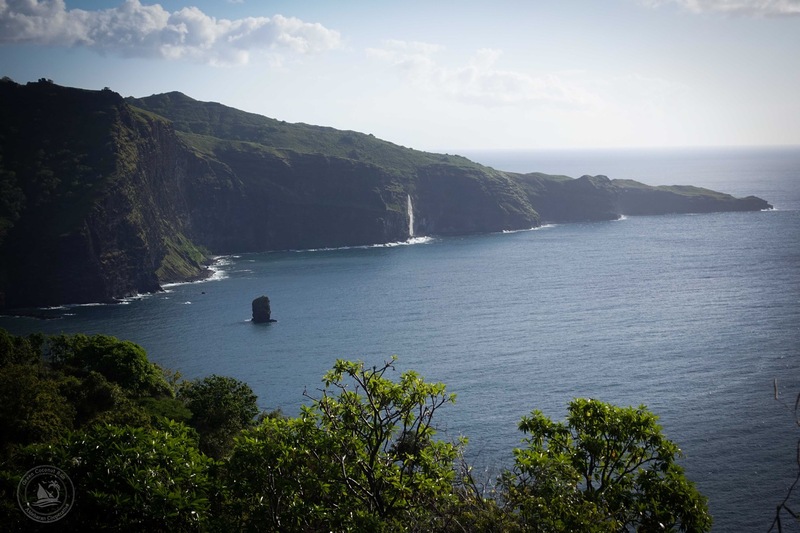 Waterfalls cascaded down the steep cliffs of Hiva Oa’s western edge, some of them plummeting directly into the water. It’s an incredible sight after the consistent rain we’ve had. To get there, it took us a lovely 1.5 hour downwind sail from the island Tahuata. 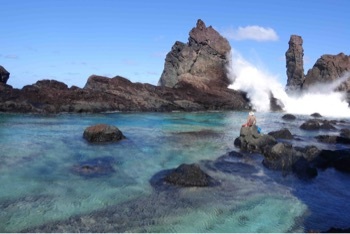 After that, we turned the corner into Hiva Oa’s north coast, and were surprised to encounter turbulent seas – the easterly wind chop was wrapping around the island causing terrible “speed bumps” for Aldebaran. After an hour of slow pounding, we tucked into the first bay, called Hanamemu. 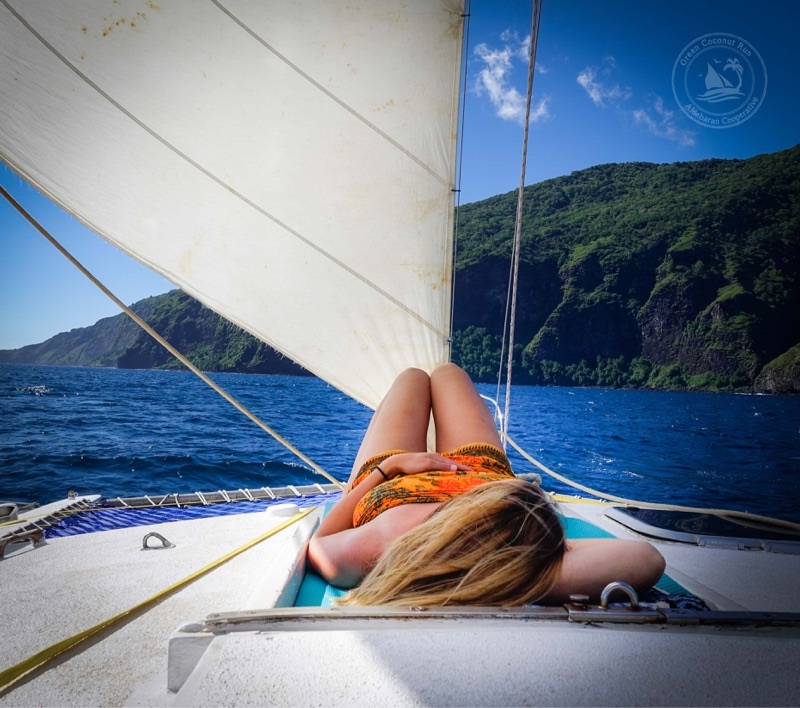 Photo: Timeless pic of Lianna as we sail downwind along Hiva Oa’s coastline. 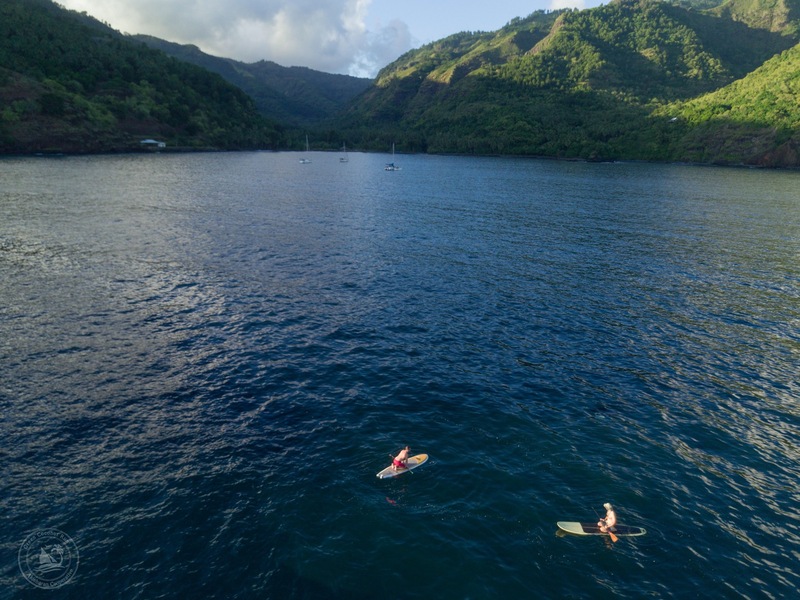 “One of the best anchorages in Marquesas” say some cruisers about Hanamoenoa Bay, a series of largely uninhabited coves just north of the village of Vaitahu. Only one or two houses are found in this bay, which are used primarily as a temporary base for copra harvesting. 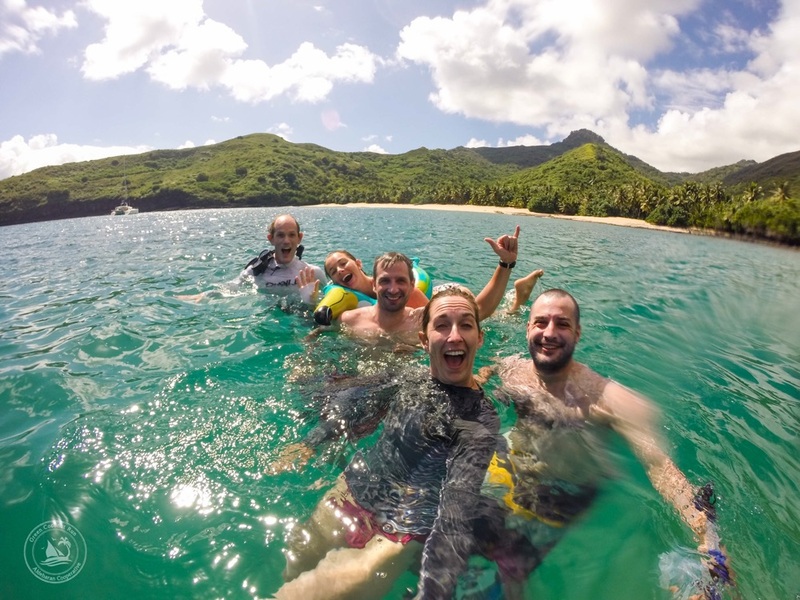 White sandy beaches are uncommon in Marquesas, which is one of the appealing qualities of this area… along with the lack of nearby rivers, which makes the water more clear than other places around this sediment-rich archipelago. We snorkeled along the rock walls, hung out at the beach, relaxing for a moment from the tough cruising life. 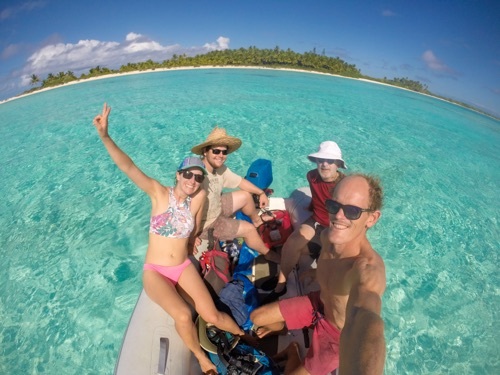 Photo shows the crew aboard Aldebaran for this leg of the voyage around Hiva Oa and Tahuata islands, in southern Marquesas: Chris, Pierre and Lianna, Sabrina and Kristian.